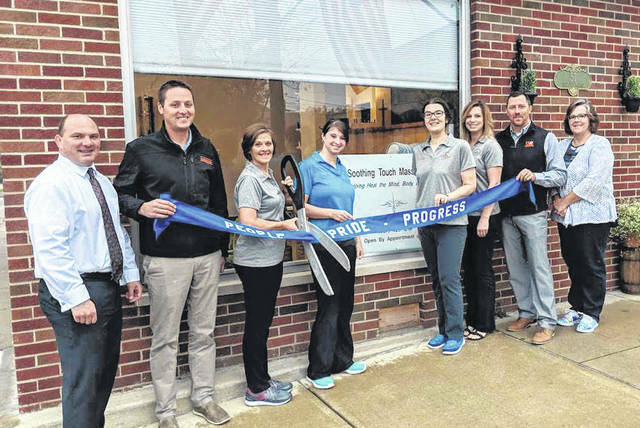 A Versailles Area Chamber of Commerce ribbon cutting was held Oct. 15 to celebrate the opening of A Soothing Touch Massage, 55 W. Main St., Versailles, owned by Colleen McKnight. Soothing Touch will hold a grand opening celebration Oct. 26. Pictured at the ribbon cutting, from left to right, are VACC members Aaron Moran, Matt Poeppelman, owner and LMT Colleen McKnight, LMTs Sarah Kaiser, Carolyn Combs, Shelly Martin, VACC members Jerry Bey and Paula Darnell. VERSAILLES — A Soothing Touch Massage announced its grand opening celebration in downtown Versailles. The public is welcome to visit Soothing Touch from 1 to 7 p.m. Oct. 26 at its newest location at 55. W. Main St., Versailles. ASTM was founded by Licensed Massage Therapist Colleen McKnight in 2005, and it has now grown to include Carolyn Combs LMT, Sarah Kaiser LMT and Shelly Martin LMT. A ribbon-cutting with the Versailles Area Chamber of Commerce was held Oct. 15. The goal of A Soothing Touch Massage is to help alleviate pain, reduce stress and promote relaxation. The business provides the following massage techniques: therapeutic, relaxation, deep tissue, pregnancy, couples and chair massage. It also offers trigger point therapy, cupping sessions and facial/scalp massage with organic Amrita products. A Soothing Touch Massage continually seeks new ways to help assist its clients holistically and introduced Kate Poeppelman PT, DPT, who will offer dry needling. A Soothing Touch Massage will offer the chance to try its infrared sauna, enjoy a mini chair massage and free samples of Amrita facial products. There will be drawings going on throughout the day, and guests will receive $5 off their next massage for scheduling during the event. Light refreshments will be served.